It’s six o’clock. You’re on your way home from work. What are you thinking about? Dinner of course! Try as you might, when you’re at this point, it’s hard to resist. You’re thinking with your stomach. We've all been there. Here's the thing: dinner doesn't have to be hard! So, maybe you've tried meal planning and it didn't go well for you. I get it. What you need is a simple meal planning method that takes the stress out of planning dinner; a meal planning method that's SO easy, it keeps you out of the fast food line. Here’s the deal—there’s nothing wrong with fast food. I mean, not really. It’s not super healthy, of course, and no one feels awesome about their life choices when their scarfing down fries in their car. If you enjoy an occasional trip to McDonalds or Taco Bell, feel no shame! Heck, fast food is freaking delicious as an occasional treat! Fast food becomes a problem when it’s your default answer every night. It’s a problem when you’re trying to save money. It’s a problem when you’re hoping to eat healthier. Fast food is a problem when you’ve got a fridge full of spoiling food at home, but you’d rather drive thru because it’s easier. I’ll be honest, I used to struggle to avoid the fast food line. It’s so convenient and it’s tough to resist when you’re hungry. 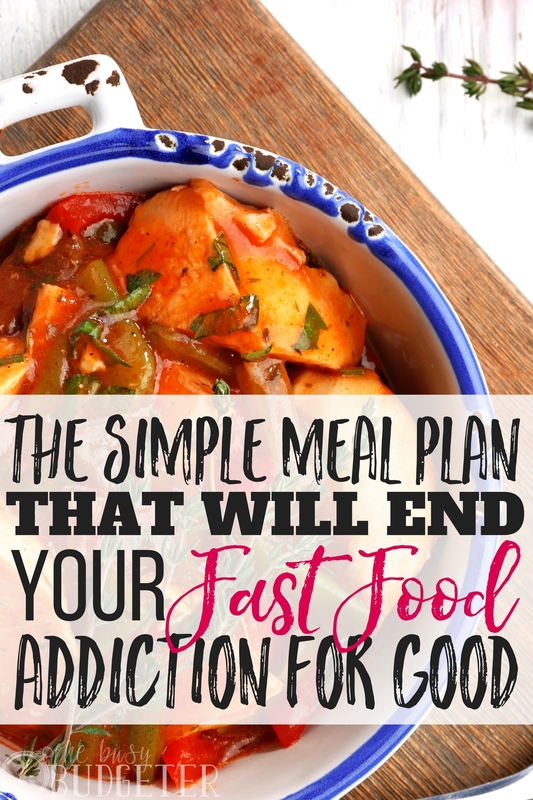 Then I discovered the simple plan that got me out of the fast food line, helped me save money, eat healthier and feel better! You guys, if I can meal plan, anyone can! Sometimes meal planning fails – and that's okay. These tips will help make sure you're always set for dinner, because these simple meal planning methods are just too easy – and totally worth your time. It's SO worth it to break your fast food addiction. Making the decision to try out some stress-free meal planning was one of the best decisions I've ever made. Isn't it time for YOU to feel that awesome, too? Here are some simple meal planning methods that have worked to keep my family out of the fast food line! Having simple meal planning methods is the real secret to staying out of the drive thru. If you want to save money and eat at home, you need to plan. It’s much tougher to say no, when you don’t have an easy, simple dinner solution in mind. When you’re on the freeway, you should already know what’s for dinner and how you can have it on the table in less time than you could wait in line at McD’s. I’m a HUGE fan of 15-minute dinner solutions. In fact, one of my top criteria for a great recipe is knowing it can be on the table STAT. I don’t have time to spend 30 minutes, 45 minutes or an hour in the kitchen. Chances are, neither do you. If you opt to use 15-minute meals as your plan, start to compile a list of meal possibilities. Each week (or month) plan out which meals you will eat, shop for ingredients so everything is on hand for your 15-minute dinner. Slow cooker meals are another option to have something hot and ready for dinner. You put all the ingredients in the crockpot before you go to work in the morning. Start your pot simmering and dinner’s ready when you get home. There are zillions of easy slow cooker recipes on the internet. Just be sure you remember to put the crock pot on before you leave. It helps to stash away pantry meals or default 15-minute meal ingredients just in case. Backwards meal planning is where you shop first, look for the best deals and then come home to plan a meal around your ingredients. You can also use the backwards meal planning method to use up ingredients in your pantry or freezer. While backwards meal planning is often less expensive, it’s challenging because some ingredients take longer to prepare. If you choose this as your meal planning method, you’ll want to plan time on the weekends to prepare. Freezer cooking combines the best of all worlds. You create bagged freezer meals that heat up fast on the stove and in the oven, or slow cook in a crockpot. All the prep is done ahead, so you might create a whole month of meals in one swoop. You can use ingredients on-hand to backwards-plan your freezer meals and incorporate sale items into your plans. Most freezer meals take less than 15-minutes to prepare and take very little time to cook. Simple meal planning methods are great to have under your belt. If you’re sold on the idea of freezer meals, it’s easy to go a little overboard at first. For real, I once had a reader report she spent 13 hours in her kitchen on a weekend, prepping three meals for the week. Don’t do that! There are definitely right and wrong ways to approach freezer meal cooking. On weeknights, when it’s super busy plan to use your freezer-to-crockpot meals. On the nights when you have a little more time, opt for freezer-to-oven meals (which usually heat up in 30 minutes). There are even freezer options you thaw in the fridge while you’re at work and grill or sauté in 15-20 minutes when you get home. With freezer cooking, you do the shopping and prep on the weekends. You cook once and eat all week long. Once I discovered freezer meals, it cut my cooking time down to 3-4 hours on the weekends. This was more manageable than weeknights, for sure, but I was still less-than-thrilled to spend so much time in the kitchen (even if it was only once or twice a month). Then I discovered MyFreezEasy! Total. Game. Changer. In ONE HOUR (I’m not exaggerating, it takes only one hour) you can prepare and freeze 10 meals. That’s two weeks of weeknight dinners! MyFreezEasy gives you the steps, the recipes, AND the ingredient lists. 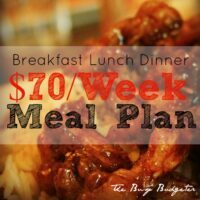 When it comes to simple meal planning methods, this plan WORKS! One hour, people! One hour, broken down across 10 days means six-minutes per dinner. Even if you live around the corner from Arby’s or Burger King, there’s no way you can get in and out in six-minutes. It’s not possible. I enjoy food, but I don’t enjoy thinking about it, figuring what and how to fix dinner. I’m too busy and I don’t have the bandwidth to research tons of recipes and ingredients my family might not even like. I need dinner that doesn’t waste brain power. One of the best parts of freezer cooking is you only cook once and you’ve got food for weeks! It means you also only clean up once! Imagine no more dirty pots and pans on weeknights. Your sink and stove will stay clean. MyFreezEasy gives you all the plans to prepare each and every meal. You can mix and match or pick meals you know your family loves. It’s in your control, and doesn’t require research or guesswork. The process for creating each meal is laid out step-by-step. Even novice cookers can rock the plan. The greatest part of this plan is it’s not expensive and you’ll get a list to follow. No more guesswork at the grocery store (or buying a bunch of ingredients you aren’t going to use). You’ll feed a family of four for around $70-80 for 10 meals! Once you have your MyFreezEasy list, you’ll go to the store and buy the ingredients. If you prefer to use a service like Peapod or Amazon Fresh, it may cost a little more, BUT you could also save because you don’t need to spend time wandering the aisles or getting tempted by sales and treats. Our grocery store offers a delivery service, so that’s also an option, depending on where you live. One of the biggest secrets to saving at the grocery store is sticking to your list. Now, obviously you’ll have your freezer meal list, but you may also want to include items for breakfasts and lunches on your list as well. Don’t deviate from your list once you’re at the store. You’ll save money and avoid wasted ingredients if you only purchase items on your plan (this goes for any meal planning technique). I find it’s easier to shop one day and cook the next. This way you’re not exhausted and you can focus on cooking. Usually I schedule cooking for a Saturday, but you do whatever works best for your schedule. Pick a day when you’ve got a full, uninterrupted hour. You may want to get a babysitter if your kids are young. While you may do the cooking yourself, get your hubby to help by wrangling and entertaining the kids while you cook. My husband and I used to LOVE cooking date nights, so if you schedule a babysitter, freezer cooking is a fun couple’s project (but the recipes are easy to manage on your own). Before you start cooking, gather all the supplies you’ll need and pull out your ingredients. I like to lay everything out on the counter and check it off to ensure I’ve got all I need to cook. Don’t forget freezer bags and sharpies to label your dinners (include a date and cooking instructions too)! That’s it! You’re ready to cook! Follow the steps in the recipe plans and you’ll have 10 meals prepped and ready to go in the freezer in one hour! After using MyFreezEasy for our freezer meals over the past few years, I’ve discovered a couple tips to help you save even more time and money with your planning. Use it for your weekly meals. Use your freezer meals for weeknights. These are the nights when you’re most tempted by fast food and need time-saving solutions. On the weekends you can backwards meal plan, use up what’s in the pantry, or even hold a smorgasbord night where you use up all the odds and ends in your fridge (for when even the most simple meal planning methods fail – hey, it happens to the best of us!). Add in a few “cheater days”. If you’re cutting back on fast food, don’t beat yourself up or go cold turkey. Build in a few “treat nights” where you can enjoy your favorite meals. 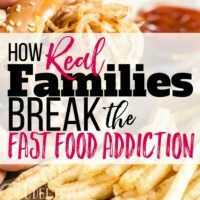 Knowing fast food is not totally off the table helps you stay realistic. Success is more attainable when you don’t completely restrict yourself. Only purchase items you need for the week. We all get tempted at the grocery store. I find when I plan to freezer cook but purchase a few extra items “in case” they often go to waste. If I stick to my list and buy only the items I need for my meals plus breakfast and lunches (and snacks) for the week, I’m much more successful. We don’t end up with wasted produce and other fridge-fails (and we stick to our grocery budget much easier!). Avoid the store all together. Grocery delivery seems like an unnecessary luxury, right? Well, before you dismiss the idea all together, weight the cost-benefit ratio. If you avoid the store, you’ll save time. You’ll also avoid the temptation to sneak items into your cart, buy treats and stuff you don’t need. Weigh the costs of automation to see if it’s worth it to you in the long run. Now that we’ve been freezer cooking for a while, I know which recipes are hits and which are misses. I also have a child with allergies, so I’m careful to adjust so the whole family can enjoy our meals safely. I keep notes on recipes because honestly, I’d never remember the details next month on cooking day. Keep notes on your meals! So, are you ready for meal planning success? If you follow these simple meal planning methods, you’ll love freezer cooking and meal planning. You won’t agonize over dinner or veer into the drive thru. You’ll save money, avoid wasted food and best of all you’ll save time cooking! What are your favorite simple meal planning methods? Do you know a few freezer meals you can’t live without? Have YOU tried MyFreezEasy? Let me know what you think! Buying fast food regularly was definitely a weakness for me. Meal planning really helped but what also motivated me to avoid those restaurants was having a strong reason not to go. For me, I wanted to save money and I was spending a lot on food. Create a goal that you really want to accomplish and this will help to keep you on track. We started meal-prepping earlier this year for lunches. We make all of our lunches for the week on Sundays, and then we’re good to go for the work week. Super easy. Dinners are still sometimes a struggle but we’re a lot better at having good things around the house to make. Having a bit more of a planned out dinner menu for the week would be great, and making stuff ahead of time would be super helpful. 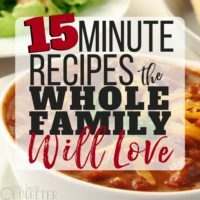 I’m also a fan of crock pot meals, but sometimes we don’t have a ton of time in the mornings during the week to throw those together in the morning. What we SHOULD do is just measure everything out the night before so it’s ready to go. All great ideas. I also like to use my electric pressure cooker. You can cook meat thawed or frozen so it’s easy to come home and throw some chicken in there with some rice and cream of chicken soup. In less than 15 minutes you’ve got your main part of the meal. Just a little salad and garlic bread and you are good to go. Most of the time I cook the chicken 12 minutes, then add the rice and soup for about 6 minutes more. That works better I think. Hi Rosemarie, I just saw you on the Bigger Pockets Money episode. You were great!. I am taking your advice and starting tonight so I came to your blog. I downloaded the bootcamp. I also looked at your FreezEasy recommendation. OMG – That is brilliant!! Simple things. I love this post! 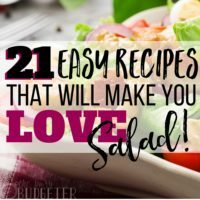 I’m a group fitness instructor and whenever my clients ask me the best way to eat healthier with a busy schedule, I always recommend meal planning. It’s so easy and it works! The more we eat at home and ditch fast food, the healthier we become. It’s that simple. Freezing is definitely one of my go-tos for easy, healthy eating at home. I make my meals for the week over the weekend and then freeze them so they stay fresh! It’s as easy as those heat up meals you get in the store, but MUCH healthier (store bought frozen meals are processed and generally high in sodium). I’d never heard of MyFreezEasy before, but it looks like an amazing resource! I can’t wait to look into it. Thanks for your awesome recommendations, Rosemarie!